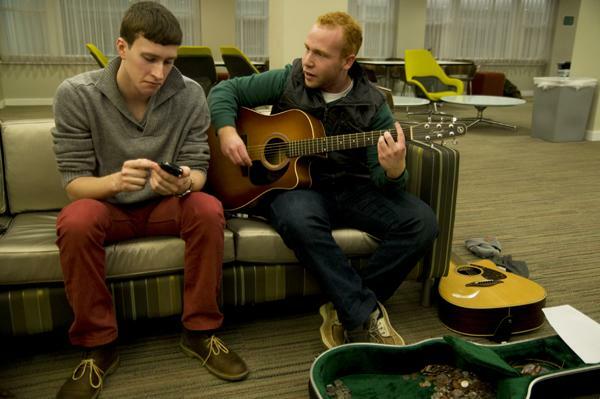 Sophomores Jules Cantor and Jon Ford play guitar and sing in Allison Hall’s lounge. The two set up the event to raise money for Josie Nordman’s lung transplant. In many ways, Josie Nordman is a typical Northwestern student: a theater major trying to balance her classes while she produces a student show, a member of the executive board of the NU Equestrian Team and an active member of her sorority, Chi Omega. But Nordman juggles her college responsibilities while battling cystic fibrosis, a degenerative disease that has left her with only 17 percent lung function. She is currently on a list for a double lung transplant. Nordman was diagnosed with CF when she was three months old. The disease causes a mucus buildup in the lungs, digestive system and other areas of the body. It makes lung infections very common and worsens as she ages. The pending lung transplant will restore her lung function, but only after placing a significant financial burden on her family. The Communication sophomore’s story spread quickly across campus and social media late last week, with students and alumni reaching out to help. She and her parents, who will pay up to $75,000 of the $750,000 total transplant costs, have welcomed the fundraising assistance. Other fundraisers will continue throughout the quarter. The Dolphin Show will auction props and costumes during its performance of “My Fair Lady” in late January and early February and donate the proceeds toward Nordman’s transplant costs. The Theatre and Interpretation Center, Chi O and the sorority Alpha Kappa Alpha are also planning fundraising activities this quarter. Jeff Sachs, a friend of Josie’s and president of Lovers & Madmen, said the Nordmans can expect fundraising from the Student Theatre Coalition all quarter. Many NU students and friends from Nordman’s hometown of Homewood, Ill., have been donating to a website set up by one of her former teachers at the Goodman Theatre in Chicago. As of Monday, the site had raised $20,929. The University of Chicago Medical Center, where Josie will have her surgery, will not withhold the procedure if the Nordmans cannot pay the $75,000 that insurance will not immediately cover, but the family will have to pay interest on any funds not available upfront. Nicolle Nordman, Josie’s mother, said the family is already overwhelmed with other bills and hospital payments, so being able to pay their portion of the transplant before the surgery would be helpful. When she was younger, Nordman said she was only hospitalized two or three times a year as long as she maintained her home treatments. But by last May, she had just 50 percent lung function. Now, she is down to 17 percent. She was finally eligible for a lung transplant Dec. 12 of last year. The transplant list’s average waiting time lasts six months, but for Nordman, who is 4 feet 10 inches and needs smaller lungs, it could take longer. A part-time student this quarter, Nordman is not taking any acting classes due to frequent medical absences. She has also had to stop riding with the Equestrian Team and wears an oxygen tank to breathe. Although the transplant procedure will not cure the CF-related problems in her stomach and pancreas, Nordman will be able to breathe normally. The procedure will be intense and require months of rehabilitation, but eventually Nordman should be able to return to her activities at NU. Until transplant organs become available, Nordman’s Chi O sister Samantha Brody will maintain a spreadsheet where friends can sign up for shifts to take her grocery shopping, make her dinner or walk her to class. Brody said she was glad to see the support for Nordman across campus. For Nordman, all the support is what convinced her to stay on campus and continue taking classes while she waits for a transplant. She could have waited at home, but the NU community makes it worth staying, she said.